The Espressomat Energy Compact automatic features four programmable buttons for volumetric dosing of water for coffee brewing from the groupheads, multi-directional stainless steel steam wand and hot water tap. 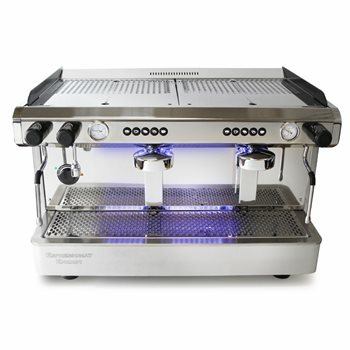 The Espressomat Energy is equipped with thermal compensated groupheads with preinfusion and a heat exchanger. With LED lighting of the working area and illuminated back panel this is the perfect machine for the busy café or restaurant.